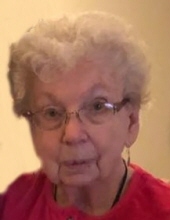 Winifred “Winnie” Janette Schwartz, age 87, of Darlington, WI passed away Saturday, March 23, 2019 at UW-Hospital in Madison, WI. She was born January 6, 1932 in Darlington, WI, the daughter of Lawrence and Alta (Arnsmeier) Mill. Winnie graduated from Darlington High School in 1949 and later from Madison Beauty School. She was united in marriage to Ray Schwartz on March 8, 1952 at her family home. Winnie lived in Darlington all of her life where she worked as a beautician for Harriet Wahlenkamp and Phyllis Whitford before working for and eventually buying out Muldoon’s Beauty Shop in 1970. From 1971 until 2002 she owned and operated Alure Beauty Shop in Darlington. Winnie is survived by her four children: Rebecca Stephens, Thomas (Karen) Schwartz, Rita (Mark) Hermanson, and Ruth Williams all of Darlington; 11 grandchildren, 19 great-grandchildren; two great-great-granddaughters; and two exceptionally great friends: Dave (Jane) Olson of Argyle, WI and Joe (Kim) Wedig family of Darlington. She was preceded in death by her parents; her husband Ray in 2011; four children in infancy; two sons-in-law: Ronald Stephens and David Williams; one brother: James Mill; and one sister: Carolyn Peterson. Winnie was a proud member of Bates-O’Brien-Howe-Wiegel- Roelli American Legion Post #214 Auxiliary of Darlington. She enjoyed crocheting, sewing, quilting, and baking. Winnie cherished the time she spent with her family, especially her grandchildren creating memories they will all remember forever. She will be sadly missed and fondly remembered by her family and friends. A memorial service will be held Friday, March 29, 2019 at 11:00 A.M. at Darlington United Methodist Church (546 Park Place, Darlington) with Rev. Angela Utter officiating. Burial will be in Union Grove Cemetery in Darlington. A visitation will be held Thursday, March 28, 2019 from 4:00 P.M. until 8:00 P.M. at Erickson Funeral Home (508 Main St., Darlington) and on Friday from 10:00 A.M. until 10:45 A.M. at the church. Online condolences may be expressed to the family at www.ericksonfuneralhome.com. For those who prefer, a memorial fund has been established in Winnie’s name. To send flowers or a remembrance gift to the family of Winifred J. Schwartz, please visit our Tribute Store. A visitation will also be held Friday, March 29, 2019 from 10:00 A.M. until 10:45 A.M. at Darlington United Methodist Church. memorials may be written out to "the family of Winifred Schwartz"
"Email Address" would like to share the life celebration of Winifred J. Schwartz. Click on the "link" to go to share a favorite memory or leave a condolence message for the family.